Reduces and prevents spots on the skin. 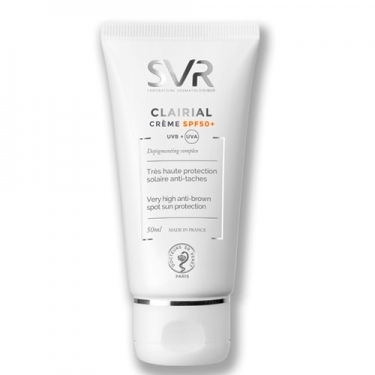 DESCRIPTION: Clairial Crème SPF50+ from SVR is a cream with a new generation UVA/UVB filter system, promotes a very high sun protection and reduces existing stains. For skin with extensive or localized dark spots. With a new generation UVA/UVB filter system, it promotes a very high sun protection and reduces existing stains. Fluid texture. Without perfume. Clinically demonstrated efficacy. In case of sun exposure renew the application every 2 hours.